Well, now, this is a bit of a revelation. I didn’t realise (or perhaps didn’t remember) that there was a Loch Lomond whisky. As far as I knew, it was a fictional whisky which was enjoyed by Captain Haddock in Tintin comics. But indeed, it exists! 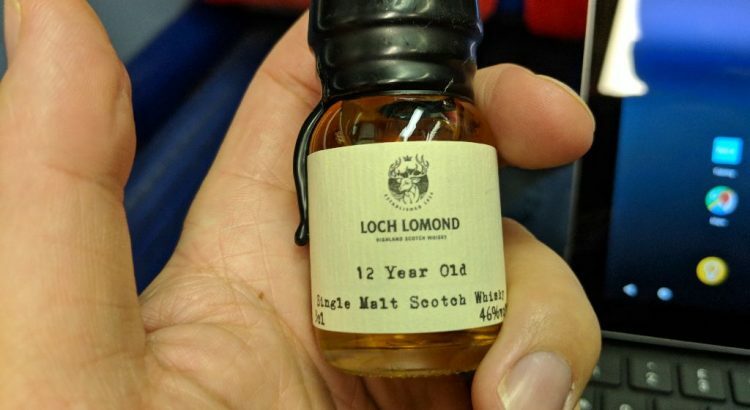 Loch Lomond is a Highland single malt weighing in at 46% and with a medium amber colour. 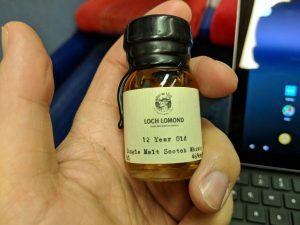 And yes, I’m enjoying my whisky on a train. It’s a bit tougher because I’m going to have to drink it straight out of the bottle and the ever-present wax is definitely having an impact on the aromas. But assuming that rubbery smell is the wax, I get fairly light and delicate smells coming from the miniature. The first taste is a bit harsher than I was expecting; not a great deal of flavour behind it and the sting of the highish alcohol content is tough to get past. In fact, this isn’t just the first theme either. It’s not got a great deal behind it apart from the general taste of malt, and anything in terms of flavours is really faint. Enjoying it over the rest of the train journey, it doesn’t get much better. It’s not anything I would really like to sip – it’s too harsh – and there’s nothing I would think it goes really well with. 6/10.